You will find below the horoscope of Véronique Genest with her interactive chart, an excerpt of her astrological portrait and her planetary dominants. Horoscopes having the same aspect Venus trine Neptune (orb 0°30'): Ariana Grande, Demi Lovato, Nicole Scherzinger, Abraham Lincoln, Mitt Romney, Novak Djokovic, Jamel Debbouze, Patrick Bruel, Anthony Bourdain, Benicio Del Toro, Amy Adams, Queen Victoria... Find all the celebrities having this aspect. Celebrities born the same day: Ariana Grande, Benoît Hamon, Aubrey Plaza, Garou (singer), Dany Boon, Chris Isaak, Derek Jeter, Ryan Tedder, Paolo Maldini, Olivier Dahan, Jennette McCurdy, Alexandra Canto... List of all the celebrities born on June 26. Celebrities clicked on in real-time: 576,872,351 times. Here are some character traits from Véronique Genest's birth chart. This description is far from being comprehensive but it can shed light on his/her personality, which is still interesting for professional astrologers or astrology lovers. 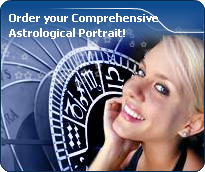 In a matter of minutes, you can get at your email address your astrological portrait (approximately 32 pages), a much more comprehensive report than this portrait of Véronique Genest. Véronique Genest, the diurnal South-eastern quadrant, consisting of the 10th, 11th and 12th houses, prevails in your chart: assertion and goals achievement are at the centre of your concerns. You are very keen to implement your dreams and your plans. You achieve your ambitions as soon as possible, whether through an active social life, highly charged friendly relations, or an urge to take actions in order to reap - in the eyes of the world, of course - the rewards of your dynamism. It is likely that spirituality or humanitarian actions are part of your motivations, sometimes at the price of some degree of isolation. Cheers for communication and mobility, Véronique Genest! The predominance of Air signs in your chart favours and amplifies your taste for relations and for all kinds of short trips, whether real (travels) or symbolic (new ideas, mind speculations). You gain in flexibility and adaptability what you lose in self-assertion or in pragmatism. The predominance of Water signs indicates high sensitivity and elevation through feelings, Véronique Genest. Your heart and your emotions are your driving forces, and you can't do anything on Earth if you don't feel a strong affective charge (as a matter of fact, the word "feeling" is essential in your psychology). You need to love in order to understand, and to feel in order to take action, to the detriment of a certain vulnerability against which you should learn to fight. The Mutable mode is the most emphasized one in your natal chart, Véronique Genest, which indicates a mobile character that is curious and thirsty for new experiences and evolution. You are lively and flexible, and you like to react quickly to solicitations, but don't confuse mobility with agitation, since this is the danger with this configuration - and with you, stagnation is out of the question. Security doesn't matter as long as you are not bored. You optimize, you change things, you change yourself... all this in a speedy way. Cadent houses, namely the 3rd, 6th, 9th and 12th houses, are very emphasized in your chart, Véronique Genest. They indicate important potential for communication, adaptability and flexibility. These houses are symbolically linked to the mind and intellect. The relative weakness implied by these characteristics indicates your tendency to hesitate or to be indecisive, but also your remarkable ability to start off again, which is a nice quality, finally: you can easily get yourself out of a tight spot thanks to your mobility and casualness, in the best sense of the term. This group of houses corresponds to evolutionary characteristics of your personality. However, they are only indications and you must include them in the rest of your chart in order to see whether they are validated or not! After this paragraph about dominant planets, of Véronique Genest, here are the character traits that you must read more carefully than the previous texts since they are very specific: the texts about dominant planets only give background information about the personality and remain quite general: they emphasize or, on the contrary, mitigate different particularities or facets of a personality. A human being is a complex whole and only bodies of texts can attempt to successfully figure out all the finer points. Véronique Genest, an enquiring intelligence, an instant understanding and a wide range of interests prompt you to go towards other people in all circumstances with a view to exchanging ideas and to show your talent for repartee. Ideas and actions must be quick and you are likely to be impatient, even critical and sarcastic with people who cannot match your frantic rhythm. You are very adaptable, you can do several different things at the same time and also think of a future action because you constantly need to be on the move. You may be criticized for your superficiality, for spreading yourself too thin and for your propensity to conceal the truth, but you always get out of tricky situations incredibly well because you are very astute, shrewd and charming. What is it, that really appeals to you, Véronique Genest, to love or to please? You have so much charm and so much volubility that you easily manage to be what is known as a femme fatale. Feelings and intellect are so tightly mingled that you may not know any more whether you are really in love or whether you are acting. You have a taste for flirt and variety, and you appreciate very much complicated situations where no one knows where the truth lies any more. You shift from one game to another. To you, everything can be an agent for seduction, be it your attitudes, your words or the way you dress. You do not separate your actions from your desire to please. People who do not understand this are in trouble because, if they take your sweet and well-phrased speeches too literally, they are likely to undergo cruel disappointments: for you, it is only a matter of living in the moment and you never commit yourself because, above all, you loathe confinement, even just its thought. The ruler of the Ascendant, Véronique Genest, is Mercury. In the sign of Gemini, it endows you with flexibility and the capacity to undertake several things simultaneously, sometimes at the risk of spreading yourself too thing and getting discouraged. Your innate communication skills match your insatiable curiosity for people and for things. You express your energy in a vague and random manner, Véronique Genest. This is not a handicap, but it prevents you from reasonably planning your long-term actions. You are a bit whimsical and scattered, sometimes hyperactive and willing to devour obstacles with your big shark teeth, but often, you take the easy way out because of your desire for tranquillity. You loathe conflicts and your cleverness and your flexibility allow you to achieve your goals while shrewdly worming your way through difficulties. Your intuition and your imagination are the assets that compensate your lack of efficiency and discipline. You are much more successful when you work for a noble cause, usually a collective one, sometimes political or spiritual ones. On the sexual plane, you are whimsical and impossible to categorize. You are so changing and malleable that you can shift from one extreme to another, according to your partner's personality, because your adaptability and your flexibility are really strong. This text is only an excerpt from of Véronique Genest's portrait. We hope that it will arouse your curiosity, and that it will prompt you to deepen your knowledge of astrology, as well as to visit and use the wide range of free applications at www.astrotheme.com. Your Life Path is influenced by the number 8, Véronique, which indicates that your destiny hinges on financial successes, material undertakings, and power seizing. It is a path full of successes and failures, fortune and reversals of fortune. You must strive to control your thirst for material goods, and try to practice tolerance. Great achievements are possible if you choose a career in any sort of trade or business. This is how your qualities are likely to be best expressed: management abilities and above-average commercial sense. Traditionally, the number 8 is believed to favour material and financial matters such as asset management, investments, commercial negotiations, as well as social power. All these elements are most likely to be found at the centre of your life. Your thirst for power, added to some degree of bad luck, constitutes one of the major hurdles blocking your way. However, your determination, added to a deep spirit of conciliation, turns the number 8 into a very fulfilling one, that of extraordinary successes.